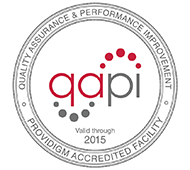 Sunnyside is excited to announce that we have recently received Providigm’s Embracing Quality Award, and also their QAPI (Quality Assurance/Performance Improvement) Accreditation. Congratulations to the entire Sunnyside team for making quality care a priority! INTERACT is a quality improvement program that focuses on the management of acute changes in patients. The goal of INTERACT is to reduce the frequency and potentially avoidable transfer of patients back to the acute hospital. We utilize the clinical and educational tools offered through the program such as early identification of a change in condition, assessment, and communication between team members to reduce the unnecessary readmission of patients to the hospital. Transfers to the hospital can be clinically difficult for residents, and result in numerous complications of hospitalization.